Pix-1 The winning 6 stage team, from left: Samantha Hughes, Natasha Hatswell, Sophie Cowper, Jenny Blizard, Lori Handbury, Nicola Devine. Pix-2 Sam Clegg brings the men's team home in 8th - their best position in over 20 years; Keiva Rennocks wins the U17 5K North of England championships. Following a very successful cross country season for the club. Rotherham Harriers athletes were again contesting at Northern level. 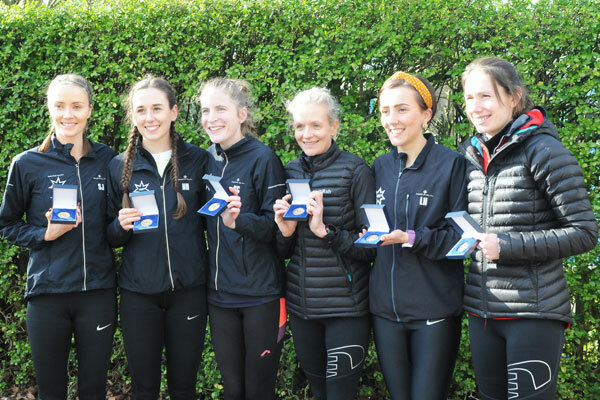 The club had two individuals in the U17 5k races (which preceded the relay events), 2 full teams in the women's 6 stage relays and one full team in the men's 12 stage relays. The relay teams were the strongest the club could field and we were hopeful of some good results. 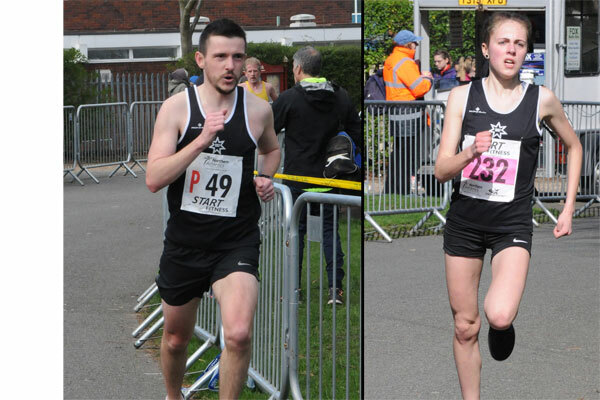 The relay entry list showed that there were also some very strong teams entered with Leeds City AC putting out strong teams in the men's and women's event, and with Leigh Harriers fielding a strong team in the women's relay, it looked set for a close race. Leeds City - who won the 6 stage event in 2018 - finishing almost 2 minutes ahead of the Rotherham team, had a stronger team than last year with 3 GB international athletes in the team, but team manager Nigel Brookes and the Harriers athletes were sure it would be a close call, and so it proved. Leg 1 had GB international athlete Jess Judd (Blackburn) back in 1st place, setting the days fastest time for the long stage of 25:43 - the only sub 26 min time for the 8K long leg. Bronwen Owen came back in 2nd place for Leeds City with the days 3rd fastest fastest time in 26.23. Importantly Samantha Hughes came in next, just 46 seconds behind Bronwen, to record the days 6th fastest time. Legs 2 & 3 were short legs of 4k and after the first 3 legs Leeds City had a lead of 46 seconds. On the 4th (long leg) Claire Duck extended Leeds lead, running the second fastest long leg time, to 1 minute and 48 seconds. Jenny Blizard ran well, recording the 7th fastest long leg time of the day, but Leigh harriers had now moved into second place through GB international Lauren Heyes. However the Rotherham team had their two fastest runners on legs 5 and 6 , and Lori Handbury went back in front of Leigh on leg 5 nad reduced the deficit to Leeds to 1 minute 7 seconds. At this stage it looked as thouggh leeds may well prevail, but Nicola Devine dug in and closed the gap, eventually passing the Leeds athlete with about 800m remaining to bring the jubilant team of athletes home in first place 29 seconds ahead of Leeds, with Leigh in 3rd. The 2019 win made this the 7th of the last 8 years that Rotherham had made the podium places in this event. The women's "B" team all ran strongly to finish 9th team and win the award for first B team. Keri pearson and Fiona Davies performed well on the two long legs and Zara Knappy made a welcome and effective return to competition recording 13:38 for the teams fastest short stage time. Whilst the women's race excitement was unfolding, the mens 12 stage team was gradually moving through the field, following Luke Cotter's 1st leg finishing position of 24th, they had made steady progress through to 7th place which the team held from legs 8 through to 11. The finishing position of 8th place is the highest achieved in the last 20 years.The mens B team only had 3 athletes, but credit to the 3 for travelling and being there for the club & if needed to cover any gaps in the A team. Thanks are due to team manager Pete Shaw, whose coaching and team organisation are a significant factor in this ongoing improvement - this is the 17th consecutive year that the men's 12 stage team have qualified for the National event - to be held on the 6th April at Sutton Park.